There’s only one week left to enter the ground-breaking Her Universe Geek Couture Fashion Show Design Competition! This is definitely an event you will NOT want to miss being a part of, whether you take a stab at submitting your designs and/or eagerly sit in the audience to see the show at San Diego Comic Con in July. Still unsure whether you can, or should, enter? Read on! So you’ve heard about this fantastic event and opportunity Her Universe has put together, maybe your friends and family have even been prompting you to enter because they think you have great design ideas, but you’re just not sure and you’ve got some questions. We went out and sourced some Q & A’s from Ashley Eckstein and Dan Madsen we hope will help you out. Must be able to provide your own transport and accommodations to San Diego. Must have outfit runway ready by July 23rd. Q: I’m not a professional designer. Is this competition only for them? A: NOPE! That’s what makes this event so fantastic! This is an opportunity for ANYONE, any fan, any amateur designer, to have a chance to not only experience what it’s like to create and show a garment on a runway, but also have an opportunity to design an actual collection with Ashley Eckstein to be sold at Hot Topic. Q: I’m not an artist and/or I can’t sew! A: No problem! Although it’s certainly helpful, you don’t need to know how to draw OR sew in order to enter, you just need to know people who can draw or sew for you! 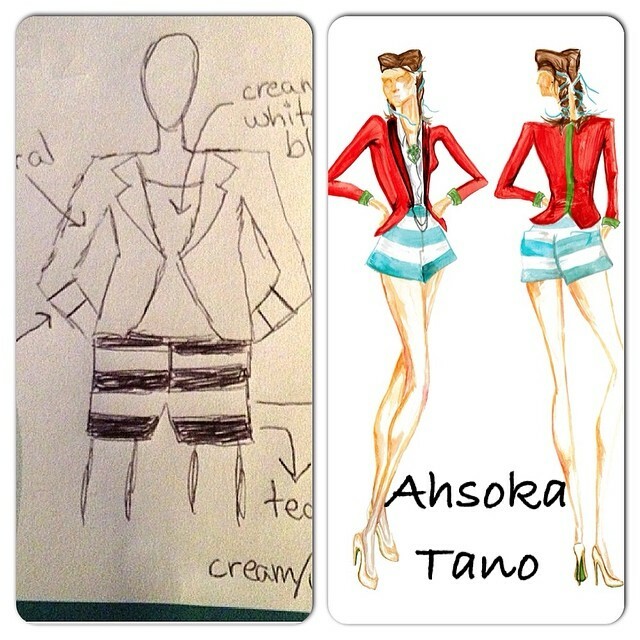 Ashley was even nice enough to illustrate this point herself when she posted the above picture explaining how she takes her basic sketch ideas and has someone with more drawing talent than herself take her designs to the next level.You are not required to have drawn the design you submit, or physically make the outfit if you are chosen to participate in the show. You just need to be the one that came up with the design. Q: Do I have to submit a design sketch? Or can I submit pictures of an actual outfit? A: If you already have an outfit made, you can totally submit photos of that instead of a design sketch. Q: Can I volunteer to be a model to wear one of these designs at the show? A: It is strongly desired that the designers model their own designs, or provide their own model. Reliable access to the model is essential during the fit process of the garment. Her Universe will work with each chosen designer to ensure they will have a model for their design. Q: Do I need to badge to San Diego Comic Con to enter? Q: What exactly is the prize? A: Two winners will have the opportunity to design a collection (2-5 pieces) with Ashley Eckstein for Hot Topic. The winners can expect to design pieces similar to what is currently being offered at Hot Topic. The designs will be inspired by one of the Her Universe licenses, which currently include Star Wars, Star Trek, Doctor Who, and The Walking Dead. Some NEW licenses Her Universe has obtained will be announced prior to the show! An opportunity like this can seem pretty daunting to even the most confident of people, but the key thing to remember is: HAVE FUN! You lose nothing by trying, so don’t stress about it. Have an idea for a geek fashion outfit? Then just enter already! You have until Friday, April 4th to submit your designs. And don’t forget to enjoy $15 off over at Her Universe right now with this coupon! I hope to see models of all different shapes and sizes too! That’s what I’m most looking forward to since we are so varied! Hope to see you the 24th!